If you’ve been a long time reader, you’ll know that food and I don’t always get along. One of my symptoms of depression actually is a worsening relationship with food. Either it’s everything is terrible and my superpower should be to never eat again or I need two of the big bags of skittles to get through the day and just forgot about cooking or grocery shopping, YUCK. My body can not handle those mentalities as well as it used to (granted it never should have in the first place but that’s another story). So to help with this, I finally caved and did something a home-schooled child would never think of doing, getting a meal planning and delivery service. I bring up the home-schooled child thing because it’s a point of pride. I know how to cook. I am relatively decent at it, I spent years meal planning for my family as a teenager from buying those groceries to making the food. I spent the majority of Kevin’s years at university making food for a group of hungry college students, something I absolutely loved (and kinda miss now) doing. It’s actually been a lot of working trying to scale back our meals to accommodate for two because it’s not something I have ever had to do before. Back to the point, I’m exactly what my parents wanted me to be when I grew up… a stay at home wife (just minus the horde of kid, thank god). And with that reality comes the expectation of being the perfect wife. Husband works 9-5 and comes home to the meal all laid out for him. He hands his jacket to his wife while taking his freshly opened but perfectly chilled drink from her hand. The smell of roast wafting in from the dinner room. OMG I’m in a horror movie. Granted that’s my definition of a horror movie, but that could be the ideal scenario for some people. This however is off topic. While I am a stay at home wife, my purpose in life is not to serve my husband perfectly in all ways. This feeling however does compound whatever depression I’m feeling and compounds more when all the emotions start to focus on food. Seeing as one has to eat at least three times a day, food comes up a lot. 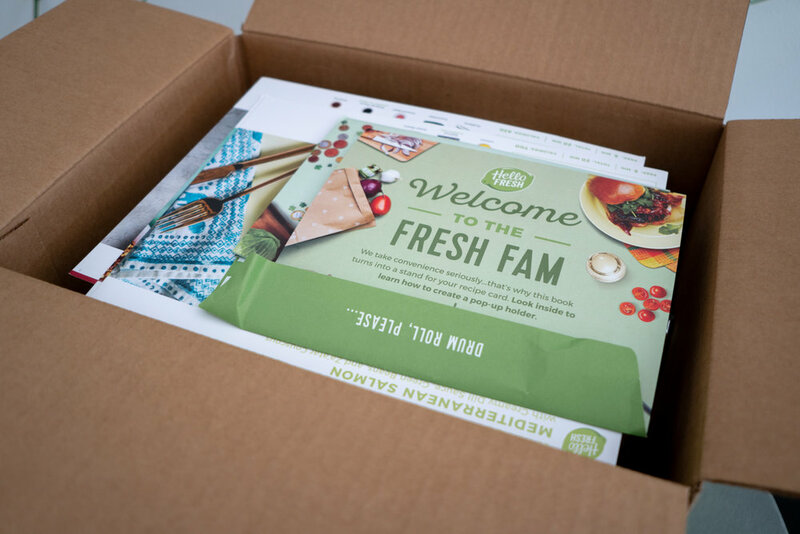 Bring in Hello Fresh. It’s a service I’ve recommended to many people. But it’s also a service I have always told myself I was too good for. Honesty here, that’s always been my exact thoughts. I was raised for this role, I don’t need these stupid millennial marketing things, stomp foot after thinking such a statement. And if life’s taught me anything, it’s that you often will stick your foot in your mouth with absolute statements, so just don’t make them. So here I am foot in mouth and hello fresh in my fridge. Two weeks ago, on a Wednesday afternoon a box arrived via UPS. They thankfully did not leave it at the office. I just opened my apartment door and there it was. It’s not heavy and everything was cold. Inside where three meals; Beef Bulgogi Bowls, Garlic Herb Tortellini, Mediterranean Salmon. The first one we made was the salmon. It included couscous, which is not our favorite thing, rice is better. However out of this meal it was the best thing on the plate. I overheated the green beans (way too easy to do in the microwave) and the salmon was alright but we have had far better. So for a first meal it was kinda a disappointment. The Gardlic Herb Tortellini was far better, I have never done a sauce that wasn’t tomato based and the baked veggies were delicious. This meal made us think it might be worth it. Lastely we did the Beef Bulgogi and this was delicious. At first we thought that there wasn’t enough rice but the rice was not the main part of the dish and the rest was so delicious, that the fact that it was instant rice wasn’t too terrible. The pickled zuchinni was delicious as was the meat. This is something I would definitely make again. I am pretty happy with our experience with Hello Fresh, though I do wish we had had time to eat all three meals before we had to decide on what we were getting the next week. Either way well depression reigns we’ll probably keep the service going. And I’ll work on letting go of that guilt. What’s your thoughts? Have you tried a food delivery service? If you want this is a referral link to HELLO FRESH. Try it if you are struggling, but there are two things I would like to note. First if you know someone in real life that uses the service, get their referral link. Because that’s just nice. Help out your friends. Two this stuff is not cheap and it is a huge privilege to be in the place that I am, as a stay at home wife and as someone who has the ability to just get a service like this. This is not an option for many many people. If you can do a service like this, maybe also donate some money to your local food bank, use that privilege to benefit others. Second Harvest is a local option for me and I am sure you can find something similar in your area.